Who says security is no laughing matter? Home security isn’t exactly a fun subject, but the latest feature for Alexa takes a distinctly light-hearted approach to keeping your home secure. 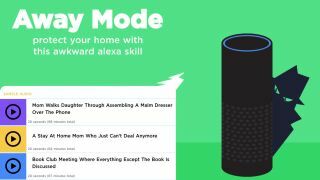 Your Amazon Echo, or whichever Alexa-enabled smart speaker you are using, will now be able to activate ‘away mode’, thanks to this new skill. Away Mode plays pre-recorded conversations designed to deter any would-be burglars from targeting your house - but it’s not just any old chit-chat. The new mode comes with seven hour-long conversations written by the minds behind Saturday Night Live, It’s Always Sunny In Philadelphia, and Upright Citizens Brigade, an improvisational comedy group whose alumni include the likes of Amy Poehler, Rich Fulcher, and Adam Walsh. With titles like ‘Two average guys brainstorm what’s unique about themselves so they can start a podcast about it’, and ‘Couple has a breakup while also trying to watch TV’, this is certainly one of the more novel takes on home security we’ve come across. There is a slight catch: the new skill was created by US insurance company Hippo, essentially making it a free but fun advertising campaign, and is only available in the US for the time being. Whether these fake conversations prove effective at fooling potential intruders remains to be seen, but if you require a more overt deterrent you can always tap into Alexa’s bank of sounds for effects like burglar alarms and barking guard dogs.